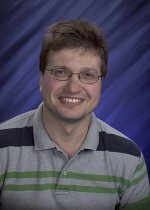 Congratulations to Dr. Alexandre Tartakovsky, a computational mathematician at Pacific Northwest National Laboratory, for winning a Presidential Early Career Award for Scientists and Engineers (PECASE). The award honors Tartakovsky's research on subsurface flow that addresses past and future energy needs: cleaning up buried nuclear or toxic contaminants and storing carbon dioxide from fossil fuels underground. Tartakovsky is an acknowledge leader in the field of computational mathematics for subsurface flow and transport in heterogeneous media. The PECASE is the highest honor given by the U.S. government to scientists and engineers who are at the start of their careers. Tartakovsky was recognized for his work trying to understand how contaminants move through the subsurface, that subterranean environment made of rocks, air, liquids like water or oil, and bacteria. Ultimately, such work will help reduce the impacts that nuclear and fossil fuel energy use have on the environment. Tartakovsky develops mathematical models to help researchers clean up nuclear or toxic contaminants from past practices or help future waste managers store carbon in the subsurface. Tartakovsky joined PNNL in 2004. He received his doctorate from the University of Arizona in 2002 and completed a two-year, post-doctoral research program at Idaho National Laboratory before joining PNNL. For more information, see the PNNL news release.